The "Feature Painting" section will showcase various paintings by Fernando Amorsolo and try to present the background story to the artwork. A short write-up will accompany the painting with various discussions that focus on the history and the technical aspects of the painting. This section will hopefully serve as a resource for art students and researchers as well as art enthusiasts who want to learn more about the artist and his work. Please visit the "Archives" page to view the previously featured pieces. 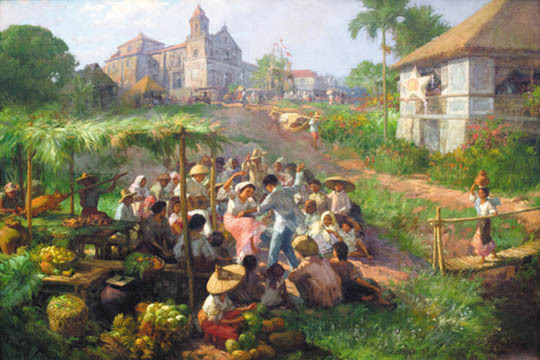 This oil painting on canvas depicts a rural scene where a group of people are shown celebrating a fiesta in Antipolo. The main focus is on a pair of dancers in the field surrounded by revelers both young and old. Abundant food is presented in basketfuls of assorted fruits on the benches and on the ground, as well as the traditional roasted pig or lechon being prepared by two men. Nearby is a house with huge windows from where dwellers watch the revelers. At the background is a huge church, a symbolic town structure. A vast number of townsmen completes the essence of a fiesta. It can be said that the pair of dancers are in the usual same pose as those of dancers in Fernando Amorsolo’s various well-known tinikling-related paintings. A viewer may be quick to surmise at a glance that this painting belongs to that category, as the bamboo handlers in the usual tinikling dance often blend in the crowd and are not easily distinguished. However, there are no bamboo-handlers present in this painting simply because the dancers are not performing the tinikling dance. Thus, this indication is what makes this painting very unique. Note: This article is an excerpt from the book "Maestro Fernando C. Amorsolo: Recollections of the family"